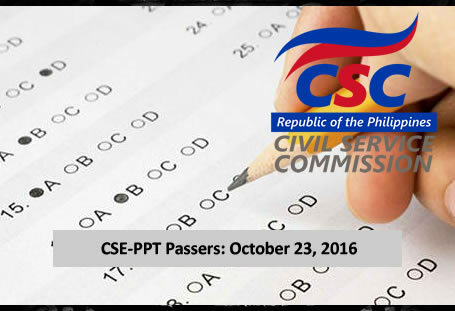 The list below contains the results for the October 23, 2016 Civil Service Exam, also called Career Service Exam - Paper Pencil Test or CSE-PPT for the Professional level in Region 5 or the Bicol Region (Albay, Camarines Norte, Camarines Sur, Catanduanes, Masbate, Sorsogon). Not the level you took or region where you are? See MAIN PAGE for complete list of passers by level & region.